98-year-old activist Grace Lee Boggs calls her approach “militant time” — a way of living for sustainable revolutionary change. This meditative question is how Grace Lee Boggs, the 98-year-old Chinese-American author and activist, has opened a great many meetings. One way of answering could be that, these days, it’s Boggs’ time. A PBS documentary, American Revolutionary, will be broadcast this year, and her 2011 book, The Next American Revolution, is already in its second edition. After decades of organizing and teaching, Boggs is newly in the spotlight. Her message of love, community and self-reliance is finding a fresh resonance in strange times. Boggs’ adopted hometown, Detroit, has been synonymous with decline for most of the 57 years she has lived there, and it has just become ground zero for the largest urban bankruptcy in American history. The poverty rate is now 42 percent for a population that is 85 percent African-American. It is the most segregated city in the United States. Throughout its 139 square miles, there is as much vacant land — most of it previously in use or inhabited — to contain all of San Francisco. But, partly thanks to Boggs, the city is now experiencing rebirth at the same time as crisis. At the beginning of American Revolutionary, we see Boggs strolling, with the aid of a walker, in front of yet another of the city’s many abandoned factories, and she says, “I feel so sorry for people who don’t live in Detroit.” Detroit and places like it, Boggs believes, are where the future is being mapped. They’re places in which our assumptions about age, success and how to live are confronting radical and necessary challenges. The global social movements of the past two years have often seemed to operate from a belief that there is an emergency requiring immediate action, one which the movements should try to solve. For Grace Lee Boggs, however, history moves in more complicated ways. In her view, shaped by her dissertation research on the philosopher Hegel, any oppressive system can be confronted, no matter how dominant it may appear. According to the outlook she calls “dialectical humanism,” a moment of danger is also one of opportunity. Detroit’s transformations have all been about time. Exactly a century ago, it was where Henry Ford introduced the automated assembly line — on Dec. 1, 1913. Work now had to proceed at the tempo set by the moving conveyor belt. Temporality itself became monetized, leading to the cliché that “time is money.” The assembly line reduced the time it took to make a car from 12.5 hours to 93 minutes. But doing so dehumanized work to a degree that had not been seen before. People became known as “hands” because it was only their hands, fulfilling one task over and over again, that were of interest to the employer. Workers repeatedly quit, despite being offered higher wages, because of the anesthetizing tedium. Charlie Chaplin produced the classic parody of this machine world in the 1936 film Modern Times. His Little Tramp character gets drawn into the machine by the gears and narrowly escapes with his life. At roughly the same time, the Marxist philosopher Antonio Gramsci was musing in an Italian fascist prison cell about the “new type of civilization” represented by what he called Fordism. Perhaps, he thought, Fordism could even escape capitalism’s tendency toward crisis by paying workers so well so that demand would always remain high. That hasn’t happened. The forms of capitalism dominant today are terrifyingly indifferent to the crises they inflict on most of us. Today’s car factories look like something out of science fiction films; robots assemble cars from start to finish in minutes amid showers of dangerous sparks that can’t harm the machines. People are nowhere to be seen. There are a few, of course, but the only hand that really matters is the one that signs the lease agreement; most people still can’t afford the car without taking on risky debt. The planet continues to warm and the air becomes ever less breathable, yet governments worldwide continue to see the proliferation of automobiles as a measure of economic growth and success. Grace Lee Boggs’ goal is not to rescue the auto industry, whose emissions have helped bring the planet to the brink of catastrophe. It’s not to pay back the purported debt of the city, a result of reduced payments from the state of Michigan and faulty projections of future entitlement expenses. She hopes for something better. Instead of mortgaging our futures to repay loans, we need to reconsider how we can spend more time together to create meaningful lives in the present — “beyond making a living to making a life,” as Boggs puts it. In Detroit, people share food with those in need on their block. They give rides to people without transport. Detroit is not just the epicenter of disaster but a pivot that points the way to a different epoch, one based around the needs of local communities. The violence of the old order’s fall provides the impetus for a new beginning. By 1963, Boggs recognized African-Americans as a revolutionary class. In the aftermath of the 1967 Detroit Rebellion, she and her husband Jimmy Boggs came to draw a distinction between a rebellion based on rage and a revolution. Rage is hard to maintain; protest, however justified, does not always lead to an alternative. That’s why she has devoted 50 years to what she calls “visionary organizing,” a slow, local alternative culture to that of consumer capitalism. What are the results? There’s a K-12 school newly opened in East Detroit whose principal, Julia Putnam, was one of the first students to participate in Boggs’ Detroit Summer program in 1992. The school stresses community-centered problem solving over pencil-and-paper testing. Seeking to puncture the school-to-prison pipeline, the new school is designed to teach the knowledge and skills to negotiate post-industrial realities rather than dependence on a failed corporate system. In a city that lost 31 school days last year to electricity cuts, Emergency Manager Kevyn Orr wants to privatize all electricity in Detroit — including street lighting. Already, locals leave their porch lights on to stand in for the city’s 40,000 broken street lights. In search of a sustainable and lasting solution, though, activists are setting out to generate their own electricity with solar panels and other renewable means. Urban farms like Feedom Freedom provide fresh food in a city with only one national chain supermarket — an upmarket Whole Foods. Feedom Freedom’s co-ordinators Wayne Curtis and Myrtle Thompson use the farm to anchor their neighborhood, creating a social and cultural hub. They’ve found that a farm is not just an instrumental tool, but a place for personal renewal, reviving people’s relationship with the land under their feet. To some, these alternatives might seem like an unrealistic way to address the vast scale of Detroit’s problems. But over and again, Boggs stresses that her approach is local, and it must begin small. She speaks of a movement based on “critical connections” rather than critical mass, one that grows organically as word spreads about functioning, sustaining alternatives. In American Revolutionary, Boggs calls her approach “militant time” — a way of living for change. It is measured not by how much wealth is generated but by how people move from outrage to creating a beloved community. This kind of work is not frantic, 24/7 activism, but designed to be sustainable over time and sustaining of each other. It grows. 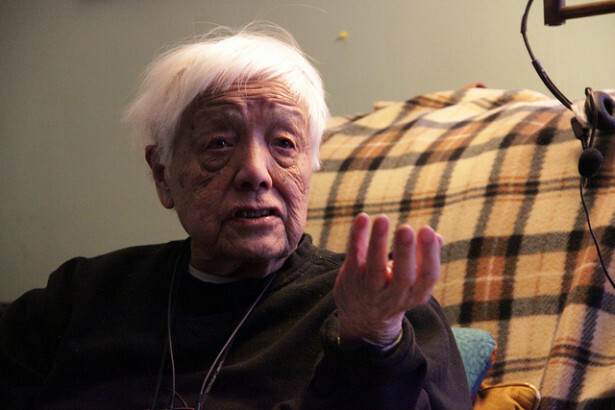 Amidst all this, Grace Lee Boggs talks a lot about love. This love is not just the flash of interaction between partners and comrades, it’s also about being visionary. To quote Detroit rapper Invincible, it’s “learning how to love after your heart has been broken” — not once, but many times, by the violence of the system and the violence in the streets. Detroit is nobody’s idea of easy. We were reminded of this recently by the murder of 19-year-old Renisha McBride, shot by a white gun-owner when she came to the door asking for help after her car broke down. If America’s urban spaces are now, in Bill de Blasio’s phrase, a “tale of two cities,” then let’s remember how Dickens told the tale originally: “it was the best of times, it was the worst of times.” For Grace Lee Boggs, dialectical humanism is about trying to turn to the best without ever forgetting the worst. Nick Mirzoeff is an activist in Occupy Theory, convener of the Militant Research Collective and a columnist for Tidal. At other times, he teaches at New York University.